For Groupe Focus, the work environment is the 7th man on the ice. The Quebec-based company is changing the way companies use their offices to facilitate and present their core competencies. 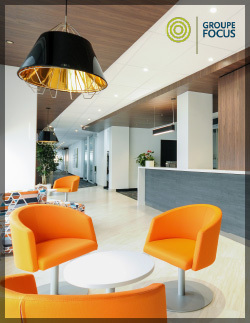 Through work environment and office furniture solutions, Groupe Focus creates motivating, inspiring, collegial, productive work offices for Canada’s largest financial, insurance, and commercial companies. modern design options of the highest quality and are dedicated to providing all their customers with optimal and innovative solutions for their work environment. 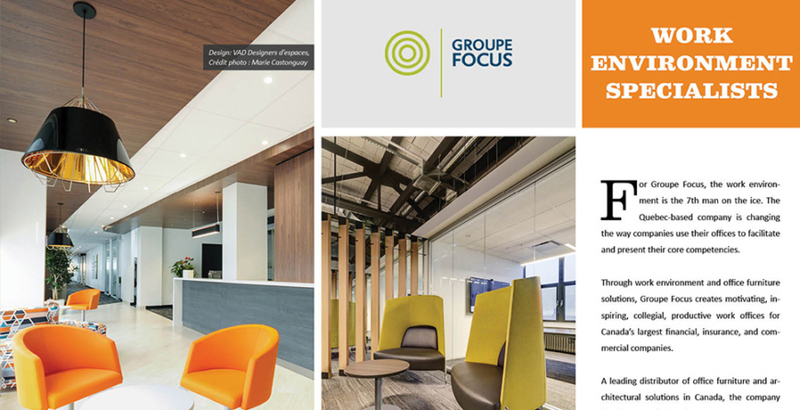 More than just a supplier, Groupe Focus is a vital business partner for its customers who rely on their expertise for practical key end solutions for their office needs—solutions that offers a tangible impact on the quality of life of employees and partners alike. Many clients say Groupe Focus has drastically increased the sense of commitment by creating stimulating environments. Clients don’t come to Groupe Focus simply for its chairs, desks, and furnishing. They are looking for ways to attract and retain the leading talent in whatever their field; to produce a continuity of brand from Vancouver to St. John’s and into the U.S., to visually present their success, competencies, and mission to whomever walks through their doors. Groupe Focus has distinguished itself through ultra-sleek modern and quality products alongside innovative services. It ensures that your work spaces live up to their full potential through strategic layouts and a proactive team of dependable and talented experts. Their unrivaled sense of communication has underpinned the company’s reputation for over 25 years. 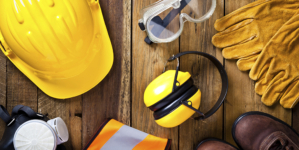 Groupe Focus services work to ensure clients can harness the full potential of your workspaces, through a proactive team of reliable and versatile experts whose unparalleled communication. “We take over the project as soon as the client has leased a space,” says Simon. 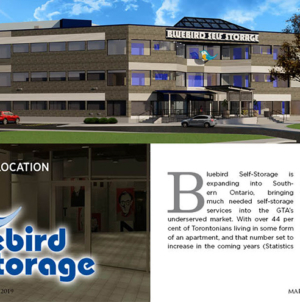 Clients are able to visualize their ideas from the onset through plans, elevations and 3D drawings, through to detailed presentations, in order to perfectly execute their vision. As an extra touch, Groupe Focus can also design and install moveable walls, another contributing factor in the company winning the silver medal in the “PWC Emerging Medal Winners” competition in the Entrepreneurial Succession category. “The moveable walls bring a whole lot of flexibility to our clientele and a lot of glamour of look, way nicer than gyprock,” jokes Simon. 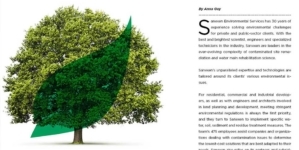 Lemieux and Simon recognize their clients’ commitment to responsible environmental consideration. Groupe Focus is the only company of its kind to offer services to match this commitment and offer a recycling service for clients which includes the collection of packaging materials from customers following installation, transportation of recyclable materials, and cardboard, metal plastic, wood and furniture sorting. 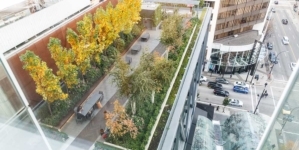 Groupe Focus is also able to contribute to obtaining certain LEED Credits on request, a major and attractive benefit to companies both financially and socially.